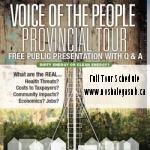 In 2014 and 2015 NBASGA conducted a Voice of the People Tour, as our members visited cities and towns across the province providing presentations on the impacts of shale gas extraction and the possibilities with clean energy alternatives. We have compiled an information package of 12 topics to help organize the mass of information available on the Internet. The Citizen’s Guide to Shale Gas is a quick, easy-to-understand reference guide based on peer-reviewed scientific research. Our Resource page contains links to a variety of research papers, videos, documentaries, web pages and magazine articles. 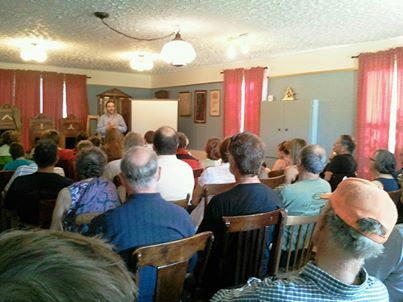 Our organization can also provide knowledgeable, highly-skilled speakers (in French or English) who can visit your community to present on a variety of topics associated with the shale gas/oil industry. Drop us an email and we will try to accommodate your schedule.